Laura is a postdoctoral researcher in the Richards-Zawacki Lab, where she is investigating the interactions between frogs, chytrid fungal disease, and the environment: specifically how climate change impacts these relationships. Laura received her a Bachelor of Arts in anthropology and Bachelor of Science in ecology and evolutionary biology from Tulane University in New Orleans, Louisiana in 2010. 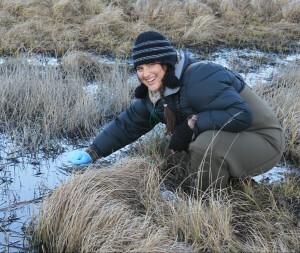 She went on to complete her Masters of Science in environmental biology from Tulane University in 2011 where she participated in a number of amphibian projects including clinical chemotherapy trials for treating Bd, studying non-amphibian hosts of the amphibian chytrid fungus, quantifying sub-lethal effects of disease, and determining best practice methods for marking amphibians. Laura received her PhD at James Cook University in Townsville, Queensland Australia in 2016. For her PhD research she explored the interactions between frogs, disease, and the management of critically endangered species. She explored pathogenesis of disease on understudied and endangered species, as well as determining mechanisms of population persistence. She hopes to be able to directly use the information generated from her research to further conservation efforts to protect Australia’s declining frog species. Laura’s research interests include amphibians, wildlife disease, endangered species, conservation, and chytridiomycosis. She is particularly interested in the mechanisms of population persistence for species declining due to disease, particularly with species and populations that have not developed an effective immune response. She is interested in the interactions between chytridiomycosis and amphibian reproduction. Laura is interested in directly combining academic research into management strategies for the protection of endangered species. Follow Laura on Twitter @LA_Brannelly, at ResearchGate, or on Google Scholar. Brannelly LA, Chatfield MWH, Sonn J, Robak M, Richards-Zawacki CL. Amphibian chytrid fungal infection has sublethal effects in a lowland subtropical amphibian population. In review. Brannelly LA, Martin G, Llwelyn J, Skerratt LF, Berger L. Age and size dependent susceptibility to chytridiomycosis in the invasive cane toad (Rhinella marina). In review. Kosch TA, Silva CNS, Brannelly LA, Roberts AA, Quintin L, Berger L, Skerratt LF. 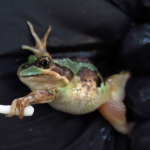 Genetic potential for disease resistance in critically endangered frog decimated by chytridiomycosis. In Review. Preprint doi: 10.1101/247999. Roberts AA, Robertson S, Webb RJ, Kosch TA, Glass B, Motti C, Berger L. Brannelly LA 2018. Skin pharmacokinetics of terbinafine in the treatment of the frog-killing fungus (Batrachochytrium dendrobatidis). Medical Mycology Accepted and in press. Brannelly LA, Roberts AA, Skerratt LF, Berger L. Terminal transferase-mediated dUTP nick end-labelling (TUNEL) and caspase 3/7 assays to determine epidermal cell death in frogs with chytridiomycosis. Journal of Visualized Experiments Accepted and in press. Brannelly LA, Webb RJ, Hunter DA, Clemann N, Howard K, Skerratt LF, Berger L, Scheele BC. 2018. Non-declining amphibians can be important reservoir hosts for amphibian chytrid fungus. Animal Conservation doi: 10.1111/acv.12380. Brannelly LA, Roberts AA, Skerratt LF, Berger L. 2017. Epidermal cell death in frogs with chytridiomycosis. Peer J 5:e2925. Scheele BC, Skerratt LF, Grogan LF, Hunter DA, Clemann N, McFadden M, Newell D, Hoskin CJ, Gillespie GR, Heard GW, Brannelly LA, Roberts AA, Berger L. 2017. After the epidemic: ongoing declines, stabilizations and recoveries in amphibians afflicted by chytridiomycosis. Biological Conservation 206:37-46. Scheele BC, Hunter DA, Brannelly LA, Skerratt LF, Driscoll DA. 2017. Reservoir‐host amplification of disease impact in an endangered amphibian. Conservation Biology doi: 10.1111/cobi.12830. Kosch TA, Eimes JA, Didinger C, Brannelly LA, Waldman B, Berger L, Skerratt LF. 2017. Characterization of MHC class IA in the endangered southern corroboree frog. Immunogenetics doi: 10.1007/s00251-016-0965-3. Brannelly LA, Hunter DA, Skerratt LF, Scheele BC, Lenger D, McFadden MS, Harlow PS, Berger L. 2016. Chytrid infecton and post-release fitness in the reintroduction of an endangered alpine tree frog. Animal Conservation 19:153-162. Brannelly LA, Webb R, Skerratt LF, Berger L. 2016. Effects of chytridiomycosis on hematopoietic tissue in the spleen, kidney and bone marrow varies between three diverse amphibian species. Pathogens and Disease 74(7):ftw069. Brannelly LA, Webb R, Skerratt LF, Berger L. 2016. Amphibian with infectious disease increase their reproductive effort: evidence for the terminal investment hypothesis. Open Biology 6(6):150251. Skerratt LF, Berger L, Clemann N, Hines HB, Hunter DA, Marantelli G, McFadden M, Newell DA, Philips A, Scheele BC, Brannelly LA, Speare R, Versteegen S, Cashins SD, West M. Priorities for management of chytridiomycosis in Australia: saving frogs from extinction. Wildlife Research 43:105-120. Bataille A, Cashins S, Grogan LF, Skerratt LF, Hunter DA, McFadden M, Scheele BC, Brannelly LA, Macris A, Harlow P, Bell S, Berger L, Waldman B. 2015. Susceptibility of amphibians to chytridiomycosis is associated with MHC class II conformation. Proceedings of the Royal Society B 282:20143127. Brannelly LA, Berger L, Marrantelli G, Skerratt LF. 2015. Low humidity is a failed treatment option for chytridiomycosis in the critically endangered southern corroboree frog. Wildlife Research 42:44-49. Brannelly LA, Hunter DA, Lenger D, Scheele BC, Skerratt LF, Berger L. 2015. Dynamics of chytridiomycosis during the breeding season in an Australian alpine amphibian. PloS ONE 10(12):e0143629. Brannelly LA, Hunter DA, Skerratt LF, Scheele BC, Lenger D, McFadden MS, Harlow PS, Berger L. 2015. Chytrid infecton and post-release fitness in the reintroduction of an endangered alpine tree frog. Animal Conservation doi:10.1111/acv.12230. Brannelly LA, McMahon TA, Hinton M, Lenger D, Richards-Zawacki CL. 2015. Batrachochytrium dendrobatidis in natural and farmed Louisiana crayfish populations: prevalence and implications. Diseases of Aquatic Organisms 112:220-235. Brannelly LA, Skerratt LF, Berger L. 2015. Treatment trial of clinically ill corroboree frogs with chytridiomycosis with two triazole antifungals and electrolyte therapy. Veterinary Research and Communication 39:179-187. Scheele BC, Hunter DA, Skerratt LF, Brannelly LA, Driscoll DA. 2015. Low impact of chytridiomycosis on frog recruitment enables persistence in refuges despite high adult mortality. Biological Conservation 182:36–43. Brannelly LA. 2014. Reduced itraconazole concentration and durations are successful in treating Batrachochytrium dendrobatidis infection in amphibians. Journal of Visualized Experiments 85:e51166. Brannelly LA, Berger L, Skerratt LS. 2014. Comparison of three widely used marking techniques for adult anuran species Litoria verreauxii alpina. Herpetological Conservation and Biology 9:428-435. Brannelly LA, Chatfield MWH, Richards-Zawacki CL. 2013. Visual implant elastomer tags are an unreliable method of identification in adult anurans. Herpetological Journal 23:125-129. Chatfield MWH, Brannelly LA, Robak MJ, Freeborn L, Lailvaux SP, Richards-Zawacki CL. 2013. Sublethal fitness consequences of infection by Batrachochytrium dendrobatidis on Northern Leopard Frogs (Lithobates pipiens). EcoHealth 10:90-98. Brannelly LA, Chatfield MWH, Richards-Zawacki CL. 2012. Field and laboratory studies of the susceptibility of the green treefrog (Hyla cinerea) to Batrachochytrium dendrobatidis infection. PLoS ONE 7(6):e38473. Brannelly LA, Richards-Zawacki CL, Pessier AP. 2012. Clinical trials with itraconazole as a treatment for chytrid fungal infections in amphibians. Diseases of Aquatic Organisms 101:95-104. McMahon TA, Brannelly LA, Chatfield WHC, Johnson PTJ, Joseph MB, McKenzie VJ, Richards-Zawacki CL, Venesky MD, Rohr JR. 2012. The chytrid fungus Batrachochytrium dendrobatidis has non-amphibian hosts and releases chemicals that cause pathology in the absence of infection. PNAS 110:210-215.